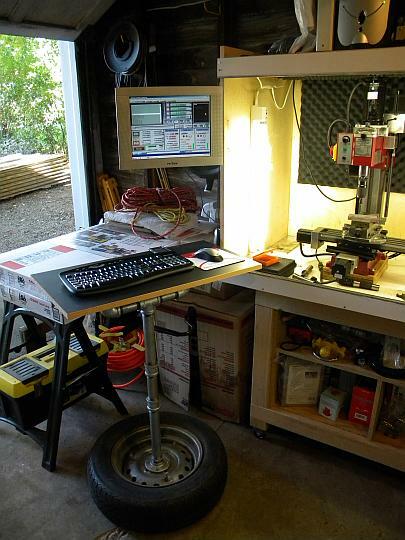 This is the “fortuitous” keyboard and mouse podium I made for my CNC mini-mill. The previous owner kept the keyboard and monitor on top of the cabinet and used a “thumb” mouse that dangled down on a cord. They obviously weren’t easy to use and I wanted some kind of table or stand to put them on. But I didn’t want to invest a lot of time or money in one because it was probably going to be temporary, until I could build a new workbench for the mill and an enclosure that can handle coolant. I considered making one from wood but I’m glad I built one using a spare tire and some pipe fittings instead. It may seem a little “red neck,” but it is very strong, very stable and easy to move. It was also quick and easy to build. A wooden stand would have probably been wobbly on my somewhat uneven concrete floor. I would have also built it too low, and I would’ve had to use it that way or cobble together some kind of riser. By using pipe, I simply had to replace one section with a longer one to increase its height to where I wanted it. If you’re wondering, the top is made from part of an old desk and it’s offset a couple of inches from the center toward the edge of the tire. For strength I supported it with two pipe flanges in a “Y” configuration. The definition of fortuitous is “happening by a lucky chance,” which describes this podium. I stopped to look at pipe fittings at Lowe’s and found they had flanges on clearance for 99 cents. If they hadn’t been I probably would have switched to wood construction, because I needed three of them and there’s no way I would have paid the normal price of $12 each. I did have to buy some reducing bushings for them, but in all, I only spent about $30 or so for the pipe parts. A friend was visiting my workshop at about the same time. I mentioned I was looking for a free tire rim and was going to put a want ad on Craigslist. A couple of days later he dropped off a spare tire and rim from a Triumph TR-6. A few days later I accidentally stumbled across a nice Microsoft wireless keyboard and mouse on sale at Walmart.com. I got them for $19, which including tax and shipping. But my luck didn’t end there. A week or two later I found a bigger and better LCD monitor at a garage sale for $10 that fit an articulating wall mount I found at another garage sale for $5! I’ve discovered that I could use another small table on the right side of the mill for my tooling and parts. So the new bench I’m going to build for the mill is probably going to be “U” shaped.